Yeah, I must admit — I am an iPhone devotee. I love the thing. One friend said it was life altering and I agree. I use it for many things to simplify (and often complicate) my life. One problem: I have all the Mass Readings and daily prayers, but when I whip it out at Mass to read along in two translations everyone thinks I am checking my email. Hum! What to do? There are wonderful iPhone aps for Catholics — yes, there is an ap for that! Here are a few I use all the time. Church Documents and other: Recordatio, iPieta, Dictionary of the Bible, Bible Dictionary, Catholic Trivia, History of the Popes, Catholic Days, and Let Us Pray. If you have favorites, please let us know in the Comments below. Having been unemployed for a long time now, I have decided to start my own shop at writing code for the iPhone. I was wondering if you would permit me to write some apps based on your documentaries the “The Footprints of God.” Would that be something you’d be interested in? Thanks in advance. Hello, was wondering if you would know of a website that speaks to Vatican II changes and why the opposition to them. I am very confused on this issue, especially when some people refer to Vatican II changes as being so negative. Thank you for any help you can provide. Thanks for the info Steve. Keep us posted with new Catholic apps. Mass Times has been recently replaced by The Catholic Directory. It works much better in determining your current location and listing near by Catholic Churches and Mass times. I have found some Mass times and parish staff locally that are out of date but there is a link on the site to send in updates. It continues to have the daily readings, and Mass videos. The Didache is one I grabbed. It is audio as well if you don’t want to read it. 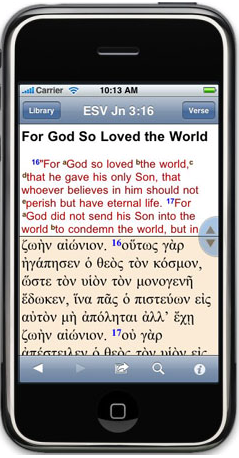 Regarding iPhone apps for the faith, I use a half dozen or so to different degrees and have found iMissal, which you mention in your original post, to be the most beneficial. In addition to a calendar containing the daily mass readings (written and audio! ), there is an exhaustive catalog of prayers by category. I use it multiple times a day and highly recommend it. Another app that is extremely powerful is iConfess. It contains a detailed Q&A on the sacrament, a guide for examining one’s conscience, and a section on prayers to be said before, during and after performing the sacrament.